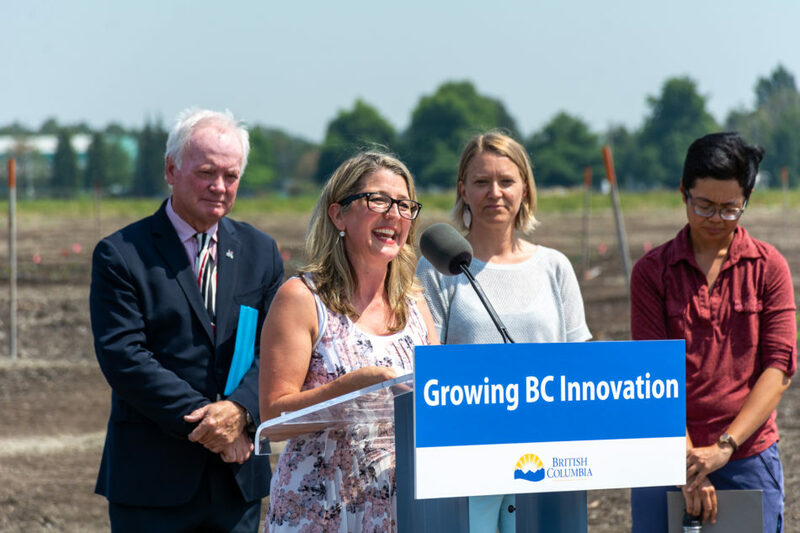 The Garden City Lands in Richmond will now be home to Kwantlen Polytechnic University’s new teaching and research farm and seed lab. The project has received a total of $1.68 million in funding from the provincial and federal governments, as well as organic seed industry partners and fundraisers. The B.C. Knowledge Development Fund and the Canada Foundation for Innovation both invested $670,000 in the project, and B.C. seed companies invested $335,000. The announcement about the project’s funding was made at the site on July 30, and Davis and Minister of Agriculture Lana Popham were both in attendance. KPU’s Department of Sustainable Agriculture and Food Systems offers programs for students looking to join the agriculture industry. It is responsible for the Tsawwassen First Nation Farm School, the KPU Orchard in Richmond, and the Campus Terrace Garden on the KPU Richmond campus. These areas are all available to students completing a Bachelor of Applied Science in Sustainable Agriculture, and the Garden City Lands farm will be used by students, faculty, growers, and researchers. The farm will yield exclusively organic produce and use high-quality soil sourced from the Lower Mainland. The quality of the soil was the subject of a small debate during the July 23 Richmond City Council meeting. Councillor Harold Steeves and Carol Day were concerned that the existing bylaw about soil deposits would allow for gravel, sand, and rock to be included in the deposits. This resulted in an amendment of the bylaw which will prevent that from happening. Davis says that KPU is also able to monitor the content and quality of the soil as it is brought in. “To the extent that it involves our programs and research, I’m absolutely sure that KPU would be involved in that discussion,” he says. Steeves was also concerned that, due to a recent drought and the fact that the Garden City Lands does not have any streams or rivers running through it, it’s possible that the farm would need to rely on rainwater or take water from the city’s supply. This could potentially cost more money. A completion date for the project has not been confirmed, but it has been funded and construction plans are underway.